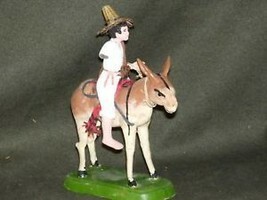 This is a listing for a vintage Mexican or South American hand made man on a burro figurine. The man's left arm is missing. He is removable from the donkey. It measures 6" tall, 3" long and 2 1/4" wide.